I recently returned from a two-day sales seminar on how to conduct a sales exploratory call. An exploratory call is a 40-minute call with a prospective customer to uncover why they want to change their marketing strategies. The training class was held for a select group of Hubspot partners in Cambridge, Massachusetts. Hubspot provides an inbound marketing and sales platform that helps agencies like IQnection to implement strategies to help their customers to attract visitors, convert leads, and turn prospects into customers. The class was led by David Winehaus and Dan Tyre*. David is a self-proclaimed introvert, while Dan is whatever the term is for the exact opposite. 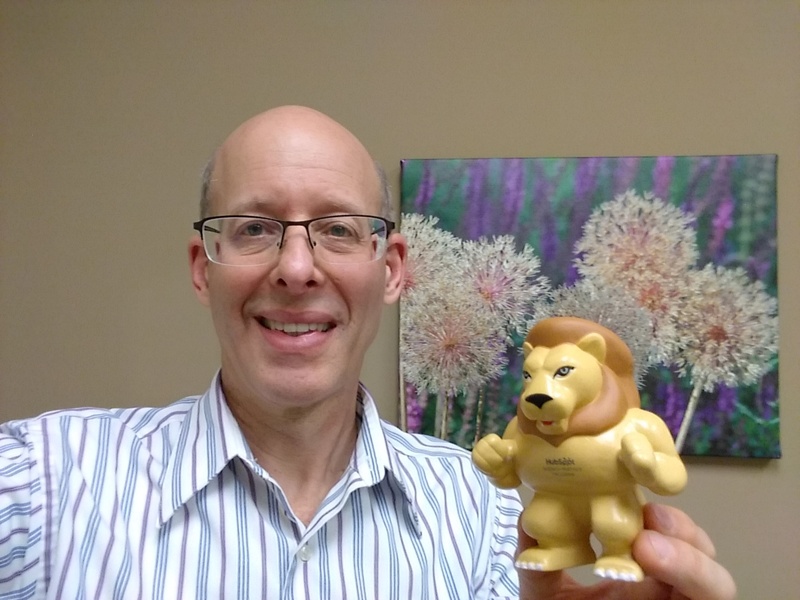 Several times during the class Dan yelled out from the back of the room, “squeeze your lion!!! !” What he was saying is we should remember to pause after we ask a question. The lion toy we received at the end of the class is to remind us to paws (pause) and listen. You’ll notice in the photo that my lion’s mane is significantly longer than mine, however after two days with David and Dan I feel my sales muscles becoming as strong as the lion’s muscles. Sadly, my mane is in a state of atrophy. Attending the class in person provided opportunities to share ideas with other Hubspot partners from all over the country (and one person from Portugal). Everyone had something to contribute to the conversation and helped me think outside our agency’s perspective. The three sale, sale – It’s important to focus on the “why” during the exploratory call. The what and how will follow in later calls or meetings. By focusing on why someone wants or needs to change their marketing strategies we can better build a solution that will meet their goals. The call should be about strategies and outcomes rather than specific tactics. Urgency – It ‘s important to uncover the ambition or urgency of the business or person. If there isn’t a sense of urgency, then it’s unlikely that the sale will close. Five ”Why’s” - Drive toward meaning/significance. Why does a person want to change what they’re doing? What does it mean to them personally if their goal is reached? It may take 4 or 5 “why” style questions to get the answer. Achieving that level of response helps to uncover the one or two things that will drive the sale because of their importance to that person. Find the gap – David emphasized this throughout the class. Talk about the current situation, then review goals and timing, finally look at plans and challenges to reach the goals. The difference between the first two items is the gap. Sell to that gap. That is where you can provide value. Sales enablement is becoming a more important product offering. Customers want to realize value right away. Help their sales team to close the opportunities. “It’s 2018” – Besides “Squeeze your lion” this was Dan’s other mantra – “Things have changed, it’s 2018.” The point is that businesses need to change and are poised to change now in a way they weren’t in the past. We are a growth agency – We help businesses grow. There are many digital marketing agencies, however we provide more value as a growth agency. I learned many more strategies and techniques from David’s class. If you have to opportunity to take the class in person I highly recommend it. It will help you move from sales lion cub, cute but ineffective, to a grown sales lion. Eric Jacobson is a business growth specialist at IQnection, a Hubspot Platinum partner, located in Doylestown, Pennsylvania.